The abundant sweet and sensuous aroma and taste of Jasmine comes from the special preparation which follows the time honoured traditions for preparing a high quality Jasmine tea. The tea is prepared by layering the flowers and organic green tea on separate trays and allowing the scent of the flower to be naturally absorbed by the tea. This process is repeated a number of times until the required scent is achieved. Because there is no physical contact between flower and tea, the taste of the Jasmine tea remains pure, sweet and richly scented. 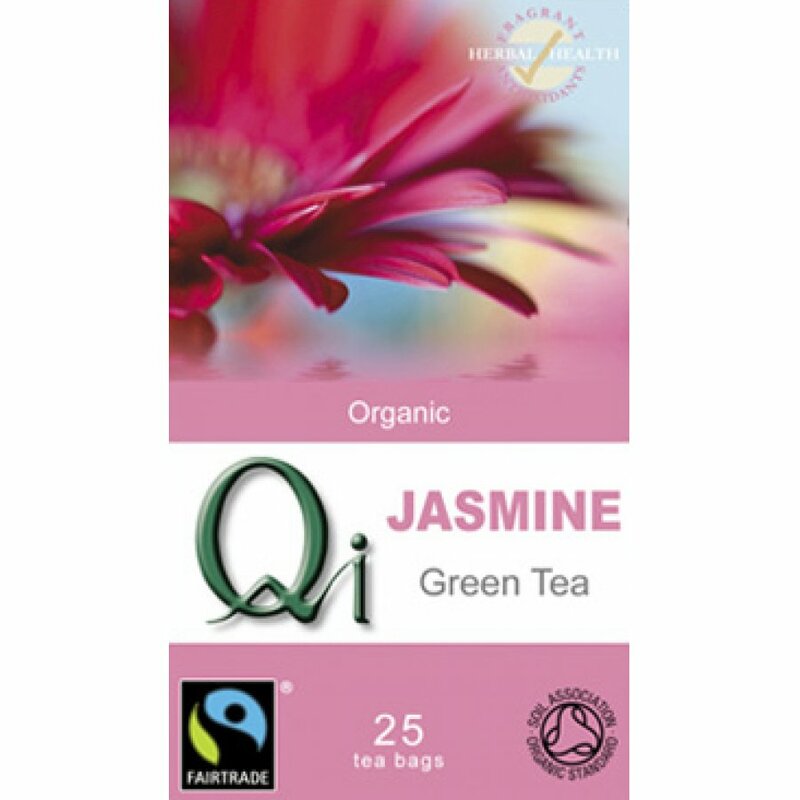 The QI Organic Fairtrade Jasmine Green Tea - 25 Bags product ethics are indicated below. To learn more about these product ethics and to see related products, follow the links below. tasty, refreshing and great value. We order all the above for staff at our offices. We loke the quality of the QI and Clipper products and buy the same products regularly. 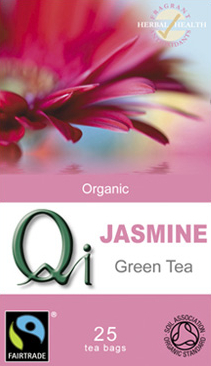 There are currently no questions to display about QI Organic Fairtrade Jasmine Green Tea - 25 Bags. Qi Teas are proud to present us with a delightful range of their finest organic and fair trade teas in partnership with the mountain communities of China. The company was set up in 1997 after its founder, Joe d’Armenia, made an inspirational voyage of discovery to China. His journey took him to regions of outstanding remote and unspoilt natural beauty and tranquillity, and the tea gardens of the Yellow Mountain region. The teas he searched out are rich and aromatic in their flavours and fragrances. They are Soil Association certified to give a guarantee of their organic status, which means they are free from all harmful chemical, pesticides and herbicides found in non-organic goods, and can be traced right back to the plant in the tea garden. The teas are also Fair Trade labelled, which gives the assurance that all involved in the production of this tea received a fair deal.